EHAC is the brainchild of our founder, Dr. Ray Bahr. The primary goal of Early Heart Attack Care is to promote public awareness that heart attacks have "beginnings" that can occur weeks before the actual attack. EHAC focuses on intervention during these beginnings to help prevent acute myocardial infarction (heart attack) and cardiac arrest. 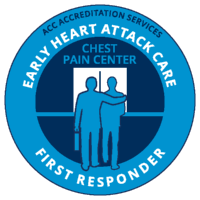 The ACC Accreditation Services (formerly the Society of Cardiovascular Patient Care) was established in 1998 as a nonprofit international organization dedicated to eliminating heart disease as the number one cause of death worldwide. We pursue this mission by providing education and accreditation to healthcare facilities to improve the care of the cardiac patient. EHAC is a public awareness campaign intended to educate the public about the signs of an impending heart attack and that these signs and symptoms can occur days or weeks before the actual event. These early symptoms need to be recognized and treated early to avoid the damage caused by a full-blown heart attack. This badge is for everyone in the community, as well as hospital professionals, and can easily be part of your community outreach, (which is Key Element No. 1 to our customers). We want everyone to understand that "heart attacks have beginnings." We want them to take the pledge and commit to educating others. They are encouraged to take the 20-minute course and we urge them to deputize at least 50 fellow hospital employees to commit to early heart attack care and stand up for the cause hospital-wide, which we will count on our official tally (now more than 10,000 strong). Once those employees take the pledge, they become ambassadors and they should have the tools to educate the community, and other people within the hospital. Once hospital professionals -- Nurses, Physicians, Employees -- are fluent on early heart attack education, we want to encourage them to weave the "buddy badge" into the community outreach programs. It reminds everyone that an accredited Chest Pain Center is the smartest place to take someone feeling symptoms. The buddy badge emphasizes that individuals throughout the community - not just hospital professionals -- should be aware that they can help save a life by taking time from their busy day to assist someone who might be feeling symptoms, but unsure of what to do. We urge them to take action, assist the person to the nearest Accredited Chest Pain Center and, possibly, save a life." Dr. Raymond Bahr writes articles about the EHAC movement. He has also done several videos that outline the importance of Early Heart Attack Care. EHAC began in 1981 at St. Agnes Hospital in Baltimore, MD. 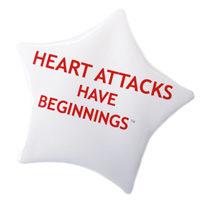 Today, the mission of EHAC remains the same - spread the message that heart attacks have beginnings. Are you a Saver or an Enabler? © 2018 American College of Cardiology Foundation. Deputy Heart Attack™, Early Heart Attack Care™, and EHAC® are trademarks of American College of Cardiology. All Rights Reserved. For more information about ACC Accreditation Services, please visit ACC Accreditation Services.